Sew! Can! Kenna: Tickled Pink!! I am an avid blog reader (when I have time) :) and tonight one of the blogs I follow as regularly-as-I-can with the punk at home (and the dude, which is just like another kid!)... Freckled Whimsy Featured me on "Tidbit Tuesday"!! WHOO HOO! :) This is exciting to my occasionally boring teacher self! And...I wanted to show that I really do use the Harbor Freight blades (on both cutters) AND I have a pack in waiting....(actually I probably have several, but the dude has taken to using my sewing room/office as the dump-anything-he-doesn't-have-a-home-for space and it's gotten a bit cluttered in there. THAT is another project for another day. Comments will be closed Friday, Feb 25 and the winner will be drawn (provided there is more than one comment!) shortly there after. Please leave a way for me to get into contact with you! 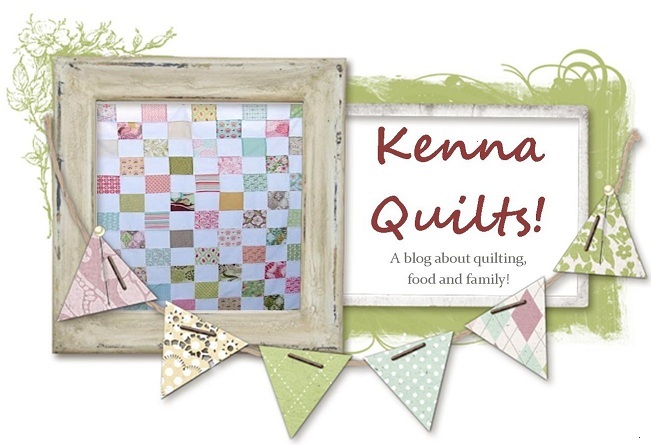 Kenna, how is it that I found your blog thru freckled whimsy? I really need to go to harbor freight, besides these blades, there's also that cool knitting bag that Sandra got there. I've just never made it down to the store! Just found your blog via Karrie. Great idea. I wonder now if Home Depot or Lowes would carry such an item--worth looking into. Just came over from Freckled Whimsy's blog. Wow, who would have thought of those working in an Olfa rotary cutter -- evidently you did! Thanks for posting about using these in your Olfa. I have a friend I picked up a pack for with the Grace rotary cutter, and she sliced her finger with her cutter. I am glad to see that you have been using them without incident. Found you from Freckled Whimsy. That is such a good tip. Thanks for sharing! What a great tip! I wonder if they will ship them overseas-being blades/knives there may be restrictions??? Hi Kenna! I've heard this tip before and have searched my area here in Canada but can't find this style of carpet blade. Thanks very much for a chance. Wonderful tip. My Quilting budget Thanks you. How do they fit on the cutters? My cutter has a weird shaped peg to fit the hole of the blade on and I thought they had to match. After reading about this, I wondered whether they stay sharp as long, or maybe even longer, than the "quilters" kind. So... if you pick me to send the giveaway to, I'll be glad to test them :-) I don't mind! What a fabulous tip. I live near Duluth, Minn and there is a Harbor Freight that I send my husband to when I want to shop at Hancock Fabrics. Duluth, here we come. What a great tip! I will have to find the nearest Harbor Freight. Visiting from Freckled Whimsy. So great to know about those blades. Thanks for sharing this! I can't wait to try them. What a wonderful tip. What a great tip. Thanks! I am here from Freckled Whimsy (love her) and plan to stay a while and look around.=) Thanks for the generosity. I am going to take a little trip to Harbor Freight tomorrow for sure. Thanks for the tip on blades. Will be trying this for sure. Love your nine patch quilt. So glad I am not the only one behind on the postage stamp quilt along! Not sure how I found your blog, but am glad I did. Thanks! Too late for the giveaway, came through Freckled Whimsy, and just wanted to say what a FABULOUS idea! Most definitely going to try it, thank you!